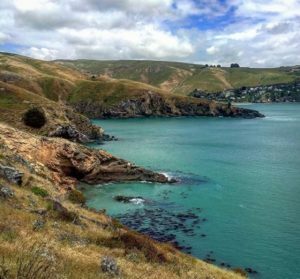 With the weather hotting up for the next week ahead we thought we’d share with you our pick of beautiful Banks Peninsula beaches. We think of Banks Peninsula as one of New Zealand’s natural treasures. With it’s abundance of bays and beaches we are spoilt for choice when it comes to finding a place to swim, relax and have some summer fun. 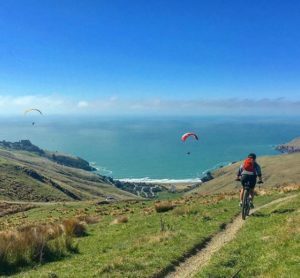 On the doorstep of Christchurch yet remote enough to feel you’re a million miles away here’s our pick of some the best Banks Peninsula beaches to visit this summer…. 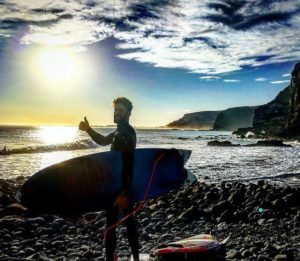 The beach is very popular with surfers as it usually gets a more powerful waved than neighboring Sumner and so it’s great beach to come to for a swim, surf, body board or to simply catch up with friends and get a nice tan. Taylors Mistake has a great set of volunteer lifeguards that patrol the beach in the summer months over the weekend. There are some fantastic mountain bike tracks in these hills and you may even spot para-gliders floating down from above. You can also do a couple of fantastic coastal cliff walks either the Godley Head track on the right-hand side (as pictured) and the Taylors Mistake Track on the left-hand side where you can walk back to Sumner. Just remember to take a bottle of water and slap some sunscreen on! Sumner Beach is another lovely beach in Christchurch….bordering that of the peninsula and Taylors Mistake it’s definitely worth adding to the list! A top tip is to head out for sunrise or sunset, and watch from above Cave Rock! Amazing views, and you can skip the busy traffic on hot summer days. It’s a lovely long open beach affording views of the Southern Alps and sometimes even the Kaikoura peaks hiding in the distance. As Sumner is a good sized open beach it’s great for a game of cricket or volleyball with friends or family. 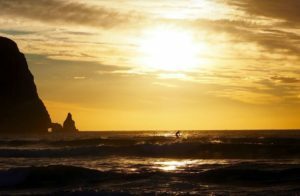 There are some fab cafes and bars in Sumner which make it a great place to visit during the day or later on as the sun sets. It does get quite busy in the summer holidays when the suns out, but being only approximately 20 minutes from the city centre it’s an easy place to get to. 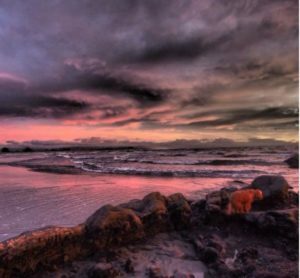 You can even take your dog to Sumner, however they are only allowed off the leash under effective control in a a certain area so please read the signs carefully. Sumner is also being patrolled by volunteer lifeguards during the summer months over the weekend. Tumbledown Bay is a small little bay, 1 hour and 15-minutes out from Christchurch via Little River. It’s a steep drive down to the bay on a dirt road so a four wheel drive is recommend. The views however on the drive over are spectacular, possibly some of the best when discovering the Banks Peninsula beaches. Tumbledown Bay is generally a quiet bay so a nice spot to relaxing and enjoy the beautiful scenery, the beautiful ocean and the nice walks around the bay. If you are lucky you might see some Hector’s Dolphins swim by. Tumbledown Bay has small sets waves so it’s good if you want to learn to surf or just a nice swim. 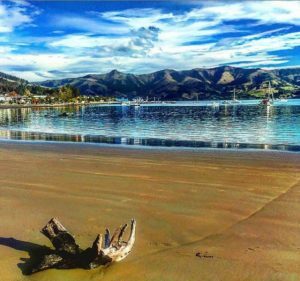 Akaroa Beach is a nice small tidal beach that is in the centre of the Akaroa township. 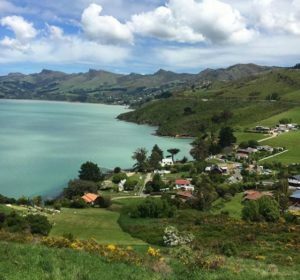 Akaroa is a just 90-minute scenic drive from Christchurch. With many things to do in Akaroa it’s nice to end the day with a nice swim and a jump of the pontoon. Bring a bucket and spade for the kids and simply take a good book and relax. You might even be in luck and see some friendly little Hector’s Dolphins come say, “hello”. Check out our recent blog about Ten Free Things To Do In Akaroa for some further inspiration. Hickory Bay is a fantastic place to go surfing. Being one of the larger Banks Peninsula beaches a 4WD is recommended for the drive down into the bay where you can park your car at the bottom and then take a foot track to the beach itself. A nice wide beach with waves ranging between 1 – 12 metres in height, it is the perfect spot. Or if you are feeling adventurous you can hike over to the bay from Akaroa and then hike back again. Hickory bay is approximately 1 hour and 46-minute drive from Christchurch. Corsair Bay is a small little sandy / pebbly bay just passed Lyttelton. With its close proximity to the city, in the summer the bay can often be packed with kids and adults alike. 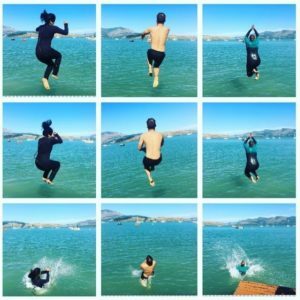 The kids have got places to jump off from into the water, including the pontoon that sits in the middle of the bay or you can go for nice short walks around either side of the bay. Pack a picnic, paddle board or grab some fish and chips from Lyttelton on the way and enjoy just one of the little gems the peninsula offers. Le Bons Bay is a bay approximately 1 hour and 38-minutes’ drive from Christchurch. 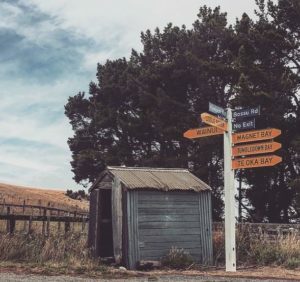 It’s a truly lovely bay on Banks Peninsula with lots of other bays surrounding it so you could visit a few in a day whilst you drive along the scenic summit road. Le Bons Bay is a bay where you can play in the river that is connected to it and where you can bring your swim stuff to and go for a nice cool swim. Okains Bay is probably best known by the locals as a great camping spot. It also has a wonderful safe beach ideal for all sorts of family activities. It’s well known for the Okains Bay Maori and Colonial Museum which contains over 3,000 Maori items. There is also a general store which dates back to 1873 and is still in operation today. Be sure to grab an ice-cream before you head to the beach! It’s only approx a one and a quarter hours drive from Christchurch and 22km from Akaroa. Cass Bay is another little bay just around the corner from Lyttelton, so pretty easy to access from Christchurch. Residents of Cass Bay have the spectacular views out over Lyttelton Harbour and towards Quail Island. Cass bay is another lovely bay to visit in the summer with the kids or with your family or friends. Bring the kids down to the water or the playground or take them for a nice walk around the bays. Just under an hour and a half’s drive from Christchurch it’s a great spot to check out. A neighbour to Tumbledown Bay you will pass through Little River along the way. Not recommended for complete beginner surfers as you have to walk out over the boulders to reach the water and the surf can get quite big. 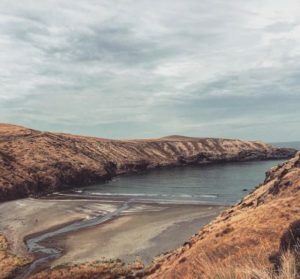 We hope we’ve inspired you to visit one of these beautiful Banks Peninsula beaches…share your snaps with us if you do by tagging @blackcatcruises We’d love to see your adventures in our local back yard! This entry was posted in Uncategorised and tagged akaroa, akaroa harbour, banks peninsula, banks peninsula beaches, cass bay, christchurch, christchurch beaches, christchurch day trip, corsair bay, hickory bay, le bons bay, lyttelton, magnet bay, new zealand, new zealand beaches, okains bay, sumner, sumner beach, taylors mistake, things to do in akaroa, things to do in christchurch, tumbledown bay.